Don’t panic, you don’t have to cut caffeine out of your life forever. As American’s are drinking more coffee than ever, the caffeine cravings aren’t slowing down anytime soon. There are even some proven health benefits of caffeine, such as a faster metabolism and greater energy and endurance. However, there are a variety of health benefits that come with a low or caffeine-free diet. See the top benefits of a caffeine-free diet to choose what is right for your body. If you’ve been feeling more anxious or restless lately, caffeine might be the culprit. Caffeine comes with a burst of energy, which is the main reason many people enjoy it. 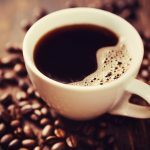 However, the extra jolt of caffeine can also stimulate a sense of anxiousness when taken in large amounts or consumed by people prone to anxiety. Too much caffeine can cause anxiety, nervousness, heart palpitations, and even panic attacks. If you are looking for a way to increase your calmness, you might want to steer clear of caffeine. Your caffeine consumption could be affecting your sleep. If your sleep schedule seems to be more unusual than normal, you should consider looking at your caffeine intake and times throughout the day. Studies show that daily coffee intake can alter your sleep cycle including side effects like daytime drowsiness and restless sleep. A good rule is to make sure you aren’t consuming caffeine six hours before your typical bedtime. Those who live caffeine-free might find it easier to fall and stay asleep. 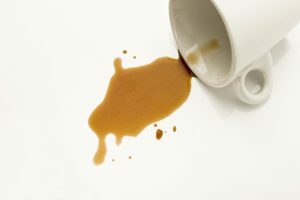 There’s no arguing it, coffee and many caffeinated drinks can stain your teeth. The high level of tannins found in many of these drinks can cause buildup on teeth and discolored tooth enamel. Similarly, the strong acidity of caffeinated drinks like coffee or soda can also lead to decay or wear on your tooth enamel. If you are looking to get a whiter and brighter smile, consider cutting back on your caffeine intake. A sad truth about caffeine is its ability to affect mood. While many might not notice, studies prove caffeine’s addictive abilities. If your body is dependent on caffeine, you could experience withdrawal symptoms as soon as 12 to 24 hours. One of the most common and displeasing side effects of caffeine withdrawal is headaches. Cutting out caffeine from your diet will help ensure your headaches and cravings don’t continue or get worse.